A talking watche with a CHOICE OF VOICE and only one exposed button. For those who simply want to tell the time, without an alarm function or an every-hour-on-the-hour announcement. 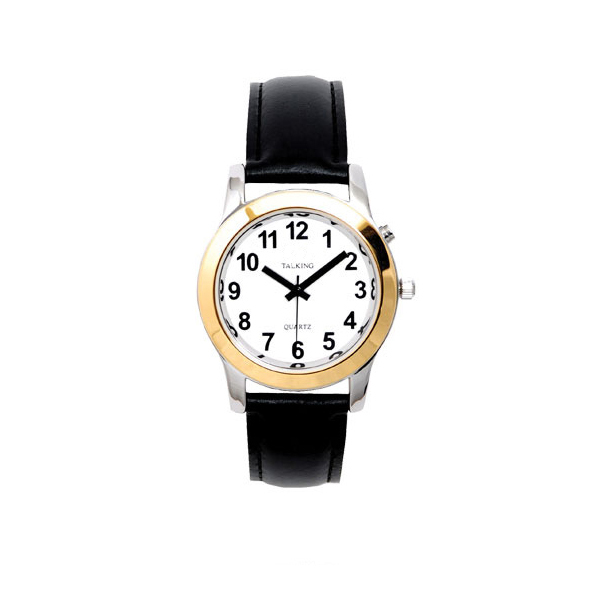 Features a two tone case with a white face and easy to see black numbers. This two-toned gold and silver talking watch is easy to hear with either a male or female speaking voice. The voice feedback makes setting this watch simple. Its face measures approximately one inch. The bold black hands contrast with its white face and two-tone casing for easy viewing. Wear this talking watch with a two tone gold and silver expansion band or a black leather band.